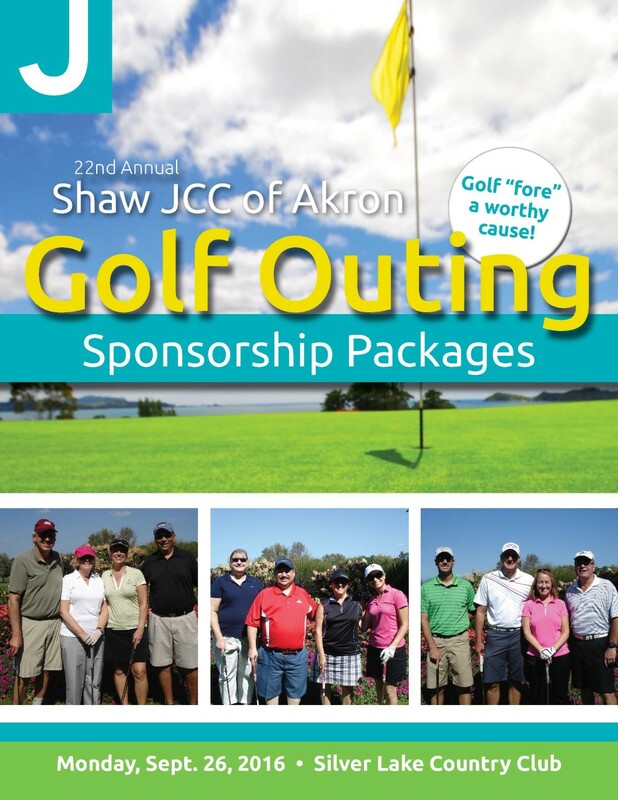 (Akron, OH) Sept. 8, 2016 – The Shaw JCC of Akron is currently accepting registrations through Sept. 16 for its 22nd annual Golf Outing, Monday, Sept. 26, at Silver Lake Country Club. Akron community leaders are invited to attend and/or sponsor the event. “Whether you play in the tournament, make a donation or sponsor the event, you will make a definite and immediate impact. Proceeds directly benefit the Shaw JCC and allow us to continue offering exceptional programming and services to our members and the community at-large,” said Michael Neumann, executive director. Everyday hundreds of children, families and seniors walk through the doors of the Shaw JCC for health and wellness, youth programs and Camp JCC, the Mandel Early Childhood Education Center, adult and Jewish programming. Hole sponsorships are $500, and a foursome with hole sponsorship is $1,200. Individual golfers are $175. Registration fees include lunch, golf, cocktails and heavy appetizers as well as contests, prizes and gifts throughout the event. Single cocktail hour tickets may be purchased for $50. Deadline to register and/or sponsor is Friday, Sept. 16. For more information, visit the event website at www.shawjcc.org/golf-outing. Current sponsoring companies and organizations include cocktail hour sponsor EdgePoint Capital Advisors; cart sponsor KJ Mirman Construction Co.; entry gift sponsor Brouse McDowell LPA; driving range sponsor Summa Health; lunch sponsor Summit Management Services, Inc.; putting green sponsor SA Comunale, Co., Inc.; and drink cart sponsor LRC Realty. Hole sponsors are Akron Children's Hospital; Alan Woll; Fifth Third Bank; Main Street Gourmet; Roetzel & Andress; S&T Bank; Sequoia Financial Group; Akron Oral & Maxillofacial Surgery Group; Akron Metropolitan Housing Authority; Audio Technica Corp.; Brennan, Manna & Diamond, LLC; Buckingham, Doolittle & Burroughs LLC; The Cardinal Group; GOJO Industries, Inc.; Key Bank; Mike Cappola; and The K Company, Inc. Golf committee chairs are Sam Pupino, Jason Butterworth and Stephanie Davis-Dieringer. Registration and driving range open at 10:30 a.m. followed by lunch at 11 a.m. The event tees off at 1 p.m. with an 18-hole shotgun start. Cocktails and heavy appetizers will be served during a team prize and award ceremony at 5:30 p.m. The event will be held at the Silver Lake Country Club a premier family club located at 1325 Graham Road in Silver Lake. This historic golf course is known for creating a classic private club experience for its guests. If you have any questions regarding the tournament, please call Jody Faught at 330-835-0025 or email jody_faught@shawjcc.org. Visit the golf outing website at www.shawjcc.org/golf-outing. The Shaw JCC of Akron has been home to our community for over 80 years. Originally named the Jewish Center, the Shaw JCC fosters a safe and secure environment steeped in Jewish values. More than 6,000 individuals of all ages, religions and socio-economic backgrounds participate in a wide range of services offered including the Mandel Early Childhood Education Center, adult and senior adults programming, fitness center, full-service aquatics programs, 11-week summer camp and the Families Supporting Families scholarship program. As a mission-based organization, we strive to serve all people, regardless of their ability to pay the cost of services. For more information visit our website at www.shawjcc.org or call 330-867-7850.